Years ago, dog food consisted of table scraps. Because they ate the same food that humans ate, they were generally healthy. And more robust than many dogs today. Pet food has evolved into a multibillion dollar industry. And canine nutrition has suffered greatly as a result. Most ingredients in commercial dog food are not fit for human consumption. Pet food is made primarily from slaughterhouse waste. This makes good business sense for multinational corporations that produce both human and pet food. These companies market their products well. Cool shapes, splashy colors, unique flavors. These campaigns are designed purely for your benefit. And despite what they would have you believe, their products are far from healthy. In fact, calling it food is a real stretch. It is virtually guaranteed to produce pet food allergies and result in a sick dog. Contrast this with the Wellness Pet Food Motivation. What's Really in Commercial Dog Food? Meat in dog food comes from poultry, cattle, fish, lambs, swine, and other animals. The choice cuts are removed for human consumption. Dog food normally contains the leftovers, including bones, blood, intestines, lungs, ligaments... And other portions not usually eaten by humans. The slaughterhouse leftovers are denatured to prevent them from being processed as human food. Meat and bone meal is created at the rendering plant. There the denatured meat is shredded and cooked at high temperatures until the fat separates from the meat. The fat is removed for later use. Water is squeezed from the remaining material to create meat and bone meal. Rendering kills bacteria, but it also removes nutrients, proteins and natural enzymes. The resulting "food" is then sprayed with fat to make it taste good. The fat also binds flavor enhancers. Your dog only cares about one thing - taste. Commercial pet food manufacturers know this and trick your dog into eating stuff that she would normally turn up her nose at. There is a nationwide class action lawsuit against commercial pet food manufacturers for utilizing misleading marketing tactics regarding the ingredients in pet food. "the rendered product from mammal tissues, including bone, exclusive of blood, hair, hoof, horn, hide trimmings, manure, stomach and rumen contents, except in such amounts as may occur unavoidably in good processing practices." "the non-rendered, clean parts, other than meat, derived from slaughtered mammals. It includes, but is not limited to, lungs, spleen, kidneys, brain, liver, blood, bone, partially defatted low-temperature fatty tissue and stomachs and intestines freed of their contents. It does not include hair, horns, teeth and hooves." Wait a minute. Does this mean my dog is eating recycled cats and dogs? "...it may not be acceptable, but nutritionally, it's still protein." "There's no way to really tell that, because the ingredient says meat and bone meal. You don't know if that's cattle or sheep or horse... or Fluffy." Watch these videotaped statements here. For more information on commercial pet food, read this shocking report. Written by a man grieving over the loss of his dog due to poor nutrition, it can help increase your dog's lifespan by up to 134% and save you up to $10,000 in vet bills. Select a natural pet food to help ensure dog health and longevit. And avoid pet food allergies. Your vet can also recommend proper pet food. But, be aware that many vets, like physicians, are not well versed in nutrition. The mandatory classes are very general and do not provide enough knowledge on how to balance an unbalanced diet. Disturbingly, many vets rely on nutritional information given to them by dog food company sales reps. This blatant marketing is disguised as nutritional education. 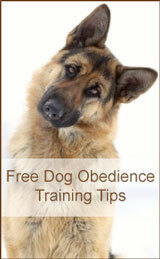 A holistic vet will generally have much better knowledge of proper German Shepherd food and nutrition. For a list of the best dog food formuals, read Top 10 Dog Foods.